This is the first time I have had the opportunity to test K7 programs. Given that the engine is VB100, West Coast, advanced plus for performance from AV-Comparatives, and ICSA labs certified, this indicates that it provides excellent protection against viruses. Version 11 has a comprehensive real time shield with exploit protection, a full firewall, privacy and phishing protection, a lot of customizable settings and more. 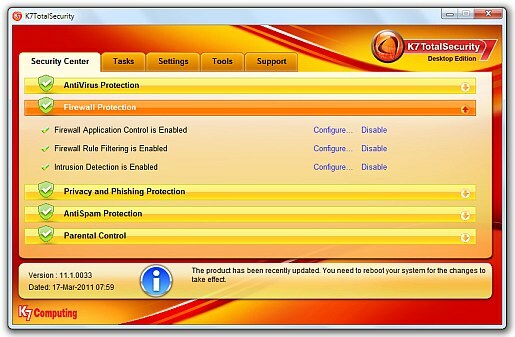 Given all these features, K7 Total Security really does provide full desktop protection. The installation of K7 Total Security was good. The download size was 70.6 megabytes which is on the smaller size for internet security software. The installer didnâ€™t give the option to change the installation drive so I had to install it on the C: drive. Once finished, the installer didnâ€™t notify for a system restart. The problem was that the internet connection completely cut out because of the new firewall driver. Therefore a restart is required to get full functionality. Also, the software didnâ€™t automatically update after the program had been running for about 1 hour and a scan had already been run. However, the good thing is that the installer had definitions for March 15 already pre-installed. K7 Total Security offers several different scanning options. There is the quick scan (scans in approximately 10 seconds for active processes only), complete, rootkit, and custom scan (files or folders). The complete scan, scans at approximately 6 megabytes per second making it faster than most free antivirus. No malware was found on the test system but indicated it found encrypted archives (could potentially be malicious, but this one belonged to VMware). One can skip the currently scanned folder or shutdown after a scan. The complete scan also finished in a brisk one hour. However, what I liked were the level of customizations offered by K7 Total Security. The real time shield scans all sorts of â€œcheck pointsâ€ including start up registry values, NT Load and Run Values, AppInit_Dlls Values, Shell Execute Hooks and more. One can disable or enable any of these protections. The scanner can also be customized to detect hacker tools, unwanted files, and scan the memory (surprisingly not checked by default). 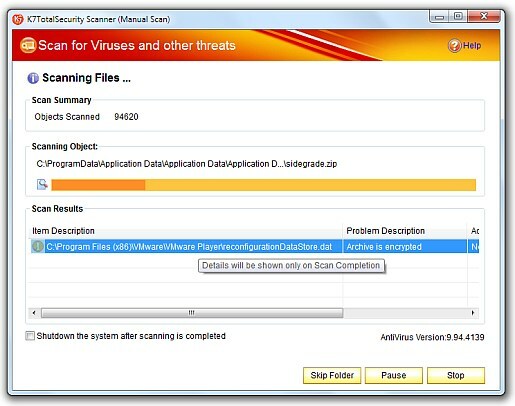 In addition to regular virus scanning there is a vulnerability and patches, abnormal changes to critical settings, and tracking cookie scanner. 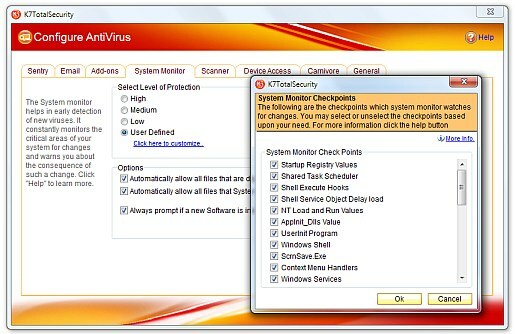 In the settings area there is a also optional script protection, a Microsoft office plugin, and instant messaging scanning that auto detects IM clients like AOL, MSN, and Yahoo. One can also configure USB, Floppy, and CD ROM drives to prompt for a password before opening and even specific group policy actions as to whether one can modify files etc. There is also â€œCarnivoreâ€ technology that provides heuristic , browser, and exploit protections. 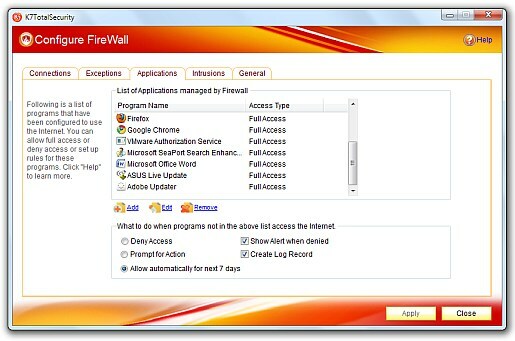 The firewall is application based but can be customized via ports. K7 Total Security properly detected Firefox, chrome, adobe updater, and an obscure but necessary VMware authorization service etc. as trusted and automatically gave them full access (indicative of an large trusted program database). There is an intrusion detection system but it only had 16 entries and clearly needed to be updated with more security advisories. The exceptions tab lets one define a range of ports and protocols. I like how one can define a custom protocol via a numeric value. There is a identify protection tab that provides standard protection by one entering personal information. However, the anti-spam has several options to customize it including the Bayesian self learning system and options to block html forms and suspicious web links within emails. Unfortunately, the toolbar is only available for outlook and outlook express. In the tools area there is USB vaccination, secure delete, a virtual keyboard, and several more than most competitors. Via the task manager one can halt all traffic and easily enter a gaming mode. While idle, K7 Total Security used approximately 45 megabytes of RAM which is definitely on the more efficient side. However, while scanning the K7AVscan.exe process gets kind of bloated and memory usage surges to 200 megabytes. CPU usage remains low at 5 to 7%. I didnâ€™t detect a major system slowdown even with a full system scan running. I would like to see some work done on the K7 Total Security Interface. I think the windows need to be bigger and the options need to be in billeted points. I also received a few cryptic alert boxes that contained no information inside.